Just a quick note to point out I have added in a few new links in the sidebar. Also I have added in a Latest Comments widget which shows the last 5 comments on this blog. 'Latest Comments' though is quite slow to update - reading a few other articles indicates this is normal, a few hours is about as quick as it gets, half a day is common, and every now and then it can get stuck or broken for extended pariods. We'll see how it goes. If you have already read the below article of the 1971 Sticks you might want to read again and check the comments as there is some interesting new information. I recently had another rush of blood to the head and bought a mixed lot of pencils online, described simply as “Old pencil case full of pencils – some used, some not”. I am rather pleased with my purchase. The pencil case had a persons name and school class number written inside, along with the year “1971”. This all seems about right. Basically all the pencils are new to me. Here’s a few. “Eberhard Faber, Made in USA, 1924”, and on the other side “Do Unto Others As You Would THE GOLDEN RULE that They Should Do Unto You” “Koh-I-Noor, Made by L & C Hardtmuth In Austria” and on the other side “2B, British Graphite Drawing Pencil, Compressed Lead”. So, it’s British yet made in Austria? I wonder if they mean the graphite came from Britain? “Made In China, THREE STARS, 600, HB”. 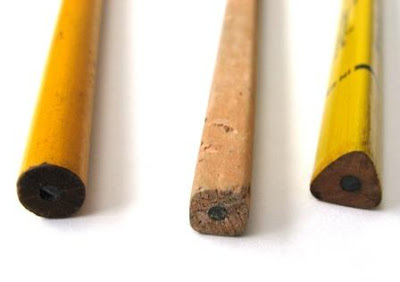 Well it doesn’t look any better or worse than all the other pencils. “Berol, EAGLE JEANS, USA, HB, 2”. The paint finish appears to be an attempt to imitate denim fabric, as in a pair of blue jeans. (Note - please read the comments. This pencil really is made from jeans !) A square unpainted, unmarked, raw pencil. 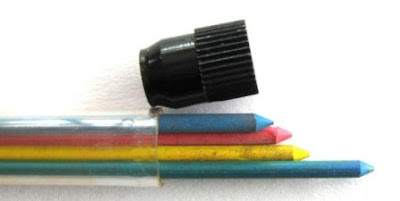 A bunch of those little tiny notebook pencils. A round pencil, "Made In Bavaria, A W FABER, Established 1761, 150, A W Faber, HB" No photo because its gold on yellow and so doesn't really show up, but a Made in Bavaria Swan Manifold Ink Pencil. 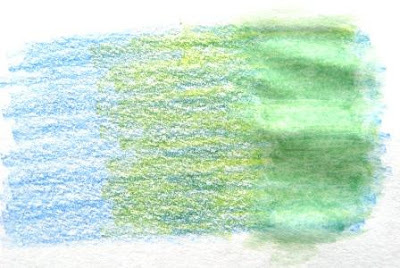 To finish - a number of used coloured pencils. They are just plain bare wood, round, with the markings simply pressed into the wood. The first few letters of the marking have been sharpened off, but reconstructed it would apparently read, “Creta Laevis, E Wolff & Son, Inventors, London, (the colour)”. The colours I have are Green No 1, Green No 3, Olive Green, Sepia No 1 and Bn Pink. The web seems strangely silent on these Creta Laevis, but apparently they are a sort of pastel pencil. Anyone know anything interesting about them? Are they still made, etc? An old pencil packet was also part of the mixed lot. 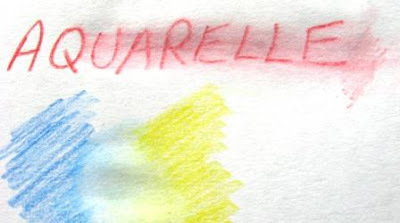 In my recent post on the Ecridor Artiste I displayed my current level of artistic skill with aquarelles. Just for the record, I am a little further advanced with plain old graphite. Not much, but a little. Kind of stuck on Still Life and objects. 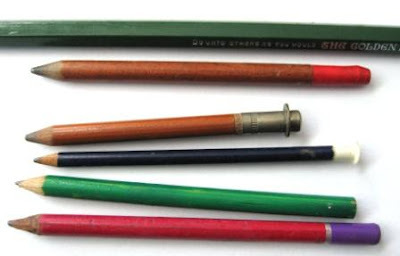 Now I like to think that I’m without pencil-prejudice or snobbery, but equally it’s true that I am partial to many a so-called luxury brand pencil. So, I was downstairs re-arranging the collection, and … Woo-hoo! The Caran d’Ache Ecridor Rhodium Chevron Fixpencil Artiste set. Now there’s a mouthful of a name if ever there was one. 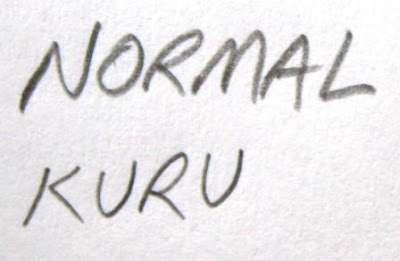 Actually you can find it called various related things, just mix and rearrange the words a bit. 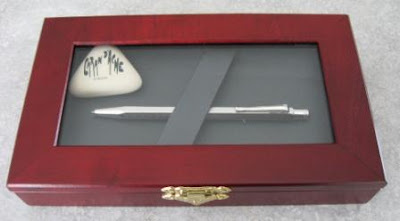 So, the nice rosewood glass-topped presentation box contains a 2mm clutch pencil - the silver-plated rhodium coated, chevron pattern Ecridor Fixpencil. 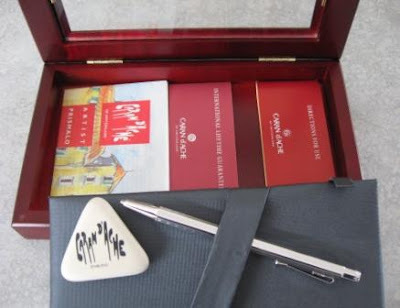 You also get an eraser, a set of coloured leads and an art booklet. The set of leads is one each of red, blue, green and yellow. Even better, they are actually aquarelles, or watercolour leads. So you use them like normal coloured leads, but also you can brush or wash them over with water to blend and create new colours. 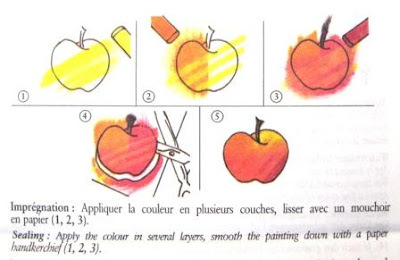 The little booklet tells you all about the various different techniques. It appears though that I have some way to go before my first exhibition. I also bought a set of ordinary graphite leads too. The eraser is rather impressive. Far too good looking to actually use, so no idea how well it really works. So, a great pencil. 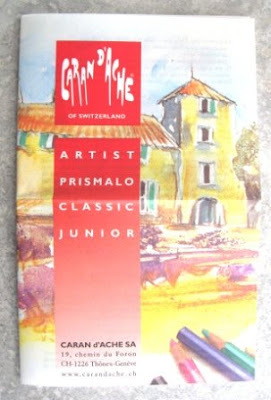 But let's just say the price is probably a bit outside the range of the average struggling young artist. It’s been gnawing away at me for ages. Just how many of you are there? These days my Sitemeter records 11 or 12 thousand hits per month for this blog, but most of these hits are just simple Google searches. My Blogger profile view counter is over 2,100. Anyway, shades of narcissism if you like, but I’d really like to know how many pencil folk there are out there, how many “regular readers”? So, time for a Poll, “How often do you read this blog?” I’ll leave it up to you to self-describe whether you are a frequent or occasional reader. Sorry, no voting button for just plain old “No”. 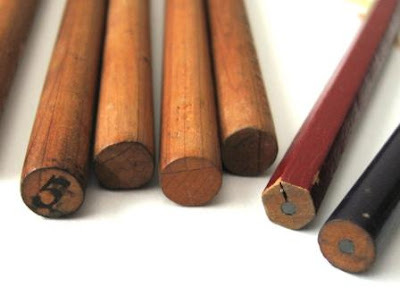 For several decades the PG1505, sometimes known as the “Accu Graph”, has been one of Pentels top offerings in their draughting pencil range. I believe it was formerly distributed throughout North America and Europe, but sadly its range has now retracted to Japan and nearby places. Even there it is apparently no longer plentiful. Hmmm, population decline, range retraction…classic signs of a species heading for extinction. I assume poor sales, as design (and art) continues its evolution as a software rather than paper based activity, is forcing the PG1505 onto the ever expanding list of endangered species. So as well as being a review, the outlook for the PG1505 is perhaps not all that rosy, so this all has a hint of eulogy and obituary about it. 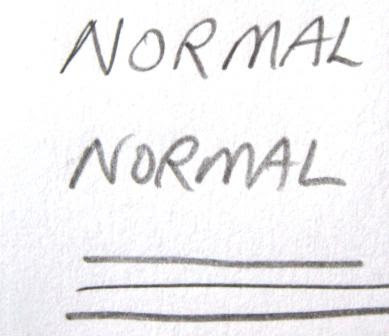 At first glance the PG1505 is a rather long, slender shaped pencil. The serious ‘technical aura’ is enhanced by the simple colour scheme of black and silver. The styling of this pencil has always reminded me of a long thin tapering calligraphy brush, and I’ve always thought that was appropriate for one of Pentels finest - I like to imagine that the Japanese calligraphy tradition played some role in inspiring the styling of this pencil. 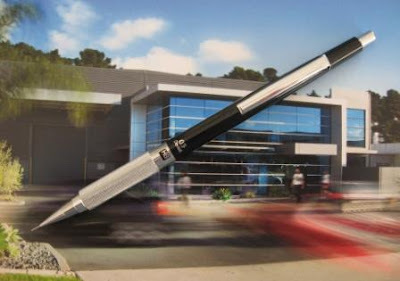 As a serious draughting pencil of considerable lineage, the PG1505 has many classic features. Starting at the tip, this is a 0.5mm lead diameter pencil and you will not be surprised to find we have a 4mm fixed sleeve. 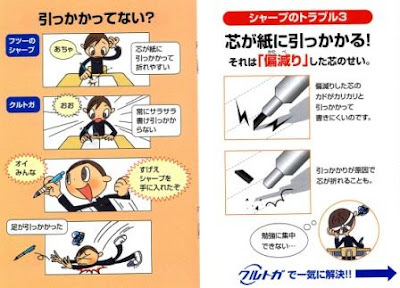 In the past, a couple of readers have raised the issue of “lead wobble” inside the sleeve. Well, I can assure you there is none with this pencil. The lead is rock solid inside that sleeve. Obviously though a long fixed lead sleeve makes this pencil pocket unsafe. Actually if you take the overall look of this pencil into account it’s sort of a mini-javelin so maybe I should rate it as super-pocket unsafe? Moving on up from the sleeve the next feature of significance is the knurled grip. This of course provides excellent non-slip grip, but sometimes I did pick up a hint of roughness. Of course you must remember that I’m just an office-wallah, not a thick-skinned toughened engineer or mega-structure architect who would laugh at such lily-livered sensitivities. The grip is not a particularly large diameter so might not suit all. The grip and other componentry give this pencil a slightly tip-heavy balance point, but not so much that the tapering upper body feels like its flapping around in the wind. So, well balanced and weighing in at 21 grams, the PG1505 feels reasonably substantial in the hand. 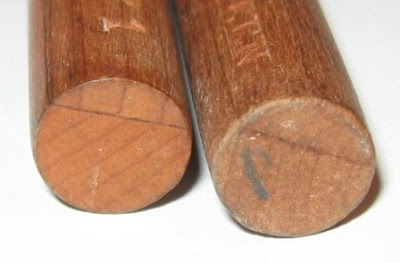 At the top of the grip there is a lead hardness indicator window. You unscrew the grip just a fraction to allow rotation of the window. 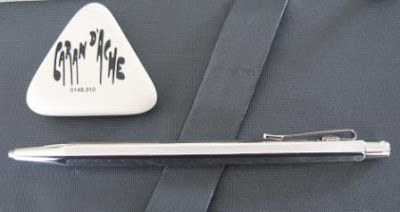 The indicator grades available are B through to 3H, including F. You have to screw the grip back up rather tight or it can work loose over time. Above the hardness indicator the body changes from metal to black plastic. It’s a good hard shiny resin that obviously won’t break, dull or scratch in a hurry. 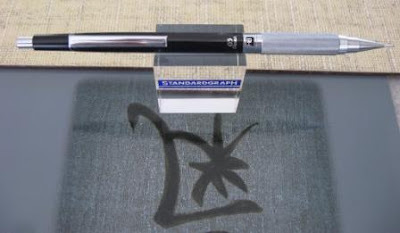 Printed in silver on the black body just above the hardness indicator is “0.5 Pentel” and “PG1505 JAPAN”. 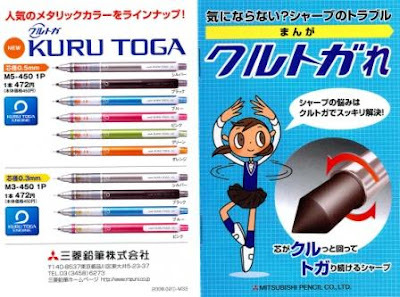 As always I am a fan of good model identification on a pencil. 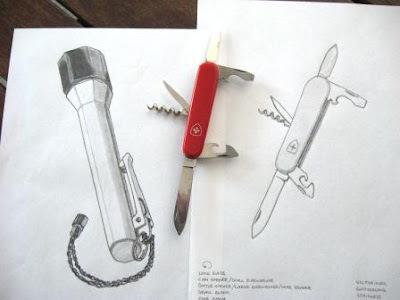 The pocket clip is a fairly plain simple piece of steel, not spring loaded, and is quite efficient and strong. Its visual austerity fits well with styling of the pencil. Finally at the very top of the body we have the small metal end cap. 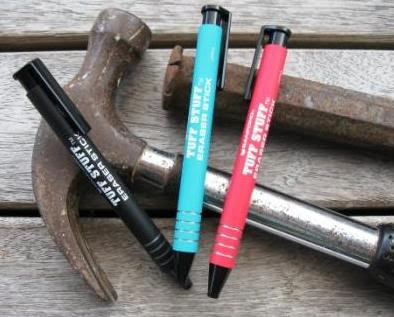 This pencil is of course push top button ratchet mechanism. 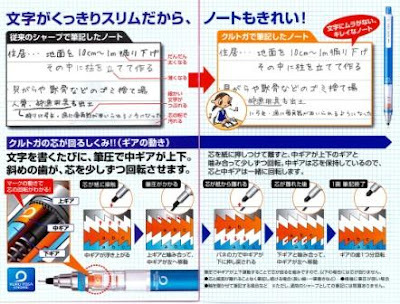 10 clicks of the button will get 5mm of lead out the tip. And when I say clicks, I mean clicks. This is a very positive, loud “clicking” mechanism. Beneath the eraser cap there is…well there isn’t the small little emergency use eraser that one usually expects. Instead there is a needle for clearing lead jams, and the end of the lead magazine is right there so fill’er up. Clearly, users of this pencil are expected to be the type who are fully prepared with a proper eraser. 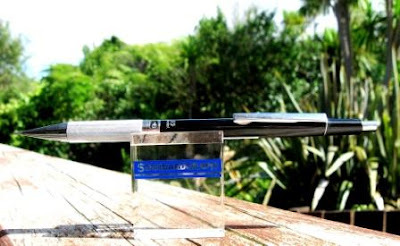 Overall then this is an excellent pencil and I’m sorry to see it gone from Pentels general international range. Best Points – The looks, and the courage to not put an eraser under that top cap. 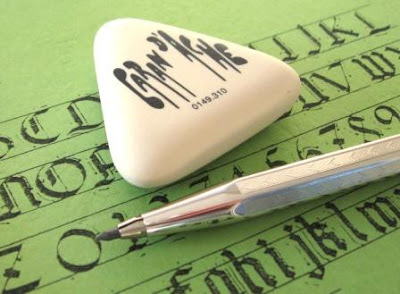 Not So Good Points – I haven’t actually mentioned it above, but there was sometimes a bit of a rattle when using this pencil. The grip is perhaps a fraction too abrasive. 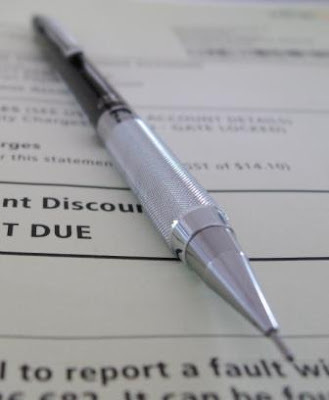 Price Range – Mid, if and when you can find it. Dimensions – Length 149mm, diameter 9mm at grip section. Balance point about 65mm up from the tip. 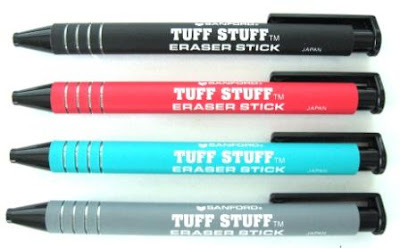 Last year I was contacted by a reader, Mark from California, who suggested I might be interested in trying his favourite eraser, the Sanford Tuff Stuff Eraser Stick, and he offered to send me a couple as “they only cost peanuts”. Well I am interested in finding the ultimate eraser, so I accepted his offer and duly received a package in the post. So, thanks Mark. 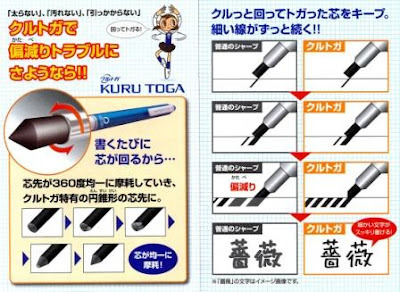 Well first off the Tuff Stuff seems a fairly typical mechanical stick eraser. 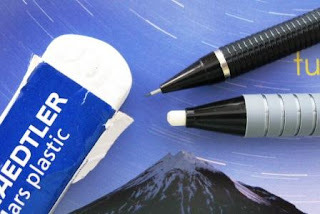 Just like many a mechanical pencil, you push the top to advance the lead, oops, sorry, the eraser core, and you can push the core back inside the tip if necessary. I think this eraser stick counts as “pocket-safe”. The pocket clip top section pulls off to allow refilling with another eraser core. I’m not completely convinced by the security of the top section to the main body and I could imagine it coming loose after much use, but then this is not an expensive item , so just get another one if that ever happens. In a quick comparison test with the test bench Staedtler Mars Plastic eraser, the Mars did a better job of erasing ordinary woodcase pencil HB lead and mechanical pencil 0.5mm HB lead from ordinary photocopy type paper. Tuff Stuff did a reasonable job, it’s just Mars was better. The difference was slightly more evident with woodcase pencil lead. In the photo below you can see there is some graphite residue left behind on the Tuff Stuff erasings (left half of page), and how the eraser waste is scattered around compared to the two twisted up strands of eraser waste on the Mars (right hand) side of the test page. Overall then, I do like this eraser, but to date, Mars Plastic plus an eraser shield remains virtually unbeatable. 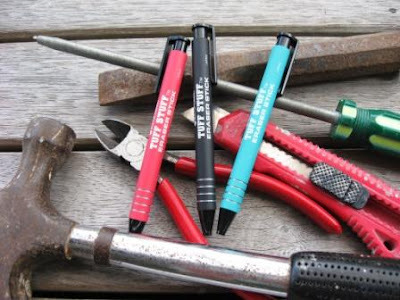 Best Points – The grip and feel, “pocketability”, and suited to finer erasing. 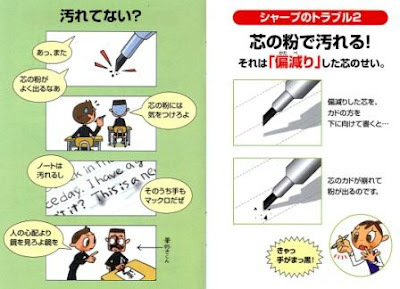 Not so good points – The eraser compound is a bit messy for frequent large scale general office work. Dimensions – Length 126mm, 11mm diameter body. 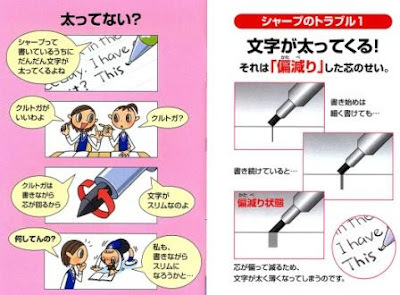 Eraser stick – c4mm diameter x 100mm length, of which about 85mm is usable. 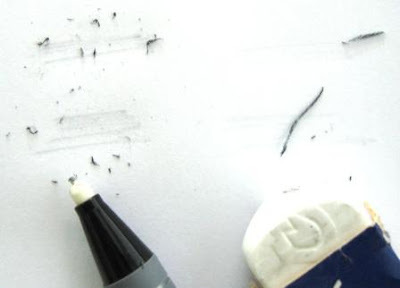 Footnote - I have started to become suspicious that larger erasers like the Mars plastic are better at erasing hard pressed pencil lines that are indented into the paper. Paper is rather flexible and I half suspect the extra pressure from a bigger eraser pulling and stretching at the paper (compared to a narrow eraser) allows for better graphite removal. Something to check out one day in the future. Any thoughts?